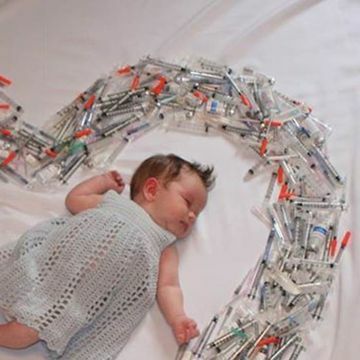 The Sher Fertility Institute posted a photo on their Facebook page depicting a sleeping baby surrounded by hundreds of syringes, depicting what really goes into IVF. Women who go through in-vitro fertilization (IVF) endure months of tests, needles, and close evaluations to be sure that once they do conceive, the pregnancy progresses smoothly. And while this has become a widely used method of having children in our society, what isn't as well known is what, exactly, goes into the process—and the toll it can take on a woman who wants nothing more than to be a mother. The basics are that IVF involves removing a woman's eggs, fertilizing them, and then placing them in her uterus. What isn't spoken about so much is the amount of testing and prolonged waiting that she goes through. In the two weeks leading up to IVF, in order to stimulate the growth of their eggs, prospective moms have to self-administer one to three fertility shots every day. Then, once the eggs have been inserted in their uterus, they need to have daily progesterone injections for two more weeks, until they can take their first pregnancy test. And while most of these women will assure you that the process is plenty worth it, studies show that IVF often takes as many as six cycles in order to work, meaning that many of these moms do in fact go through years of injections. We don't talk enough about the physical and emotional struggle women face when going through the IVF process, but it is there. And when the Sher Institute shared this photo on its Facebook page, they made it possible for those otherwise uneducated on the topic to see that just because it is a common way for us to have children, it doesn't mean that it is easy.